Now designers can create to reflect their creativity with the help of Janome embroidery machines. They offer incredible quality tools to your creative talents. Janome embroidery machines are quite easy to use. Each Janome Embroidery Machine has a patented built-in embroidery unit that eliminates the needs to bulky attachments. 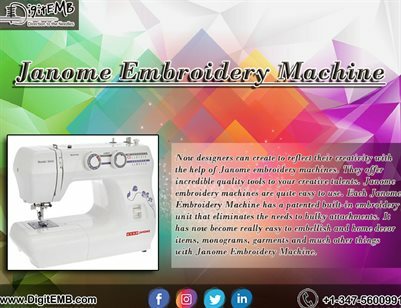 It has now become really easy to embellish and home decor items, monograms, garments and many other things with Janome Embroidery Machine. You want to use them for your personal styling items, home based business or if you want to work with these machines on a very professional level, these machines can do them all.